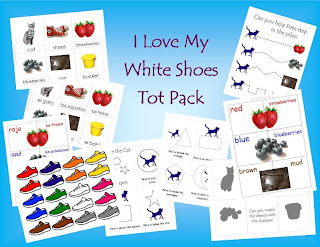 A Pete the Cat Printable pack I made a couple years ago has definitely been my most widely used printable. In order to allow for even greater flexibility, I updated it to include Spanish version of all the pages. 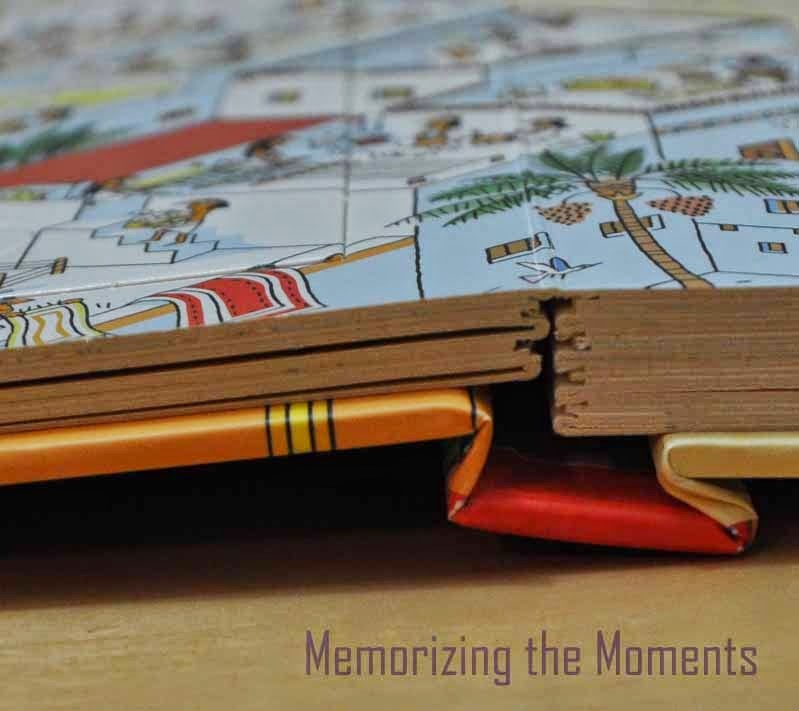 Follow Kaysha @ Memorizing the Moments's board Pete the Cat on Pinterest. 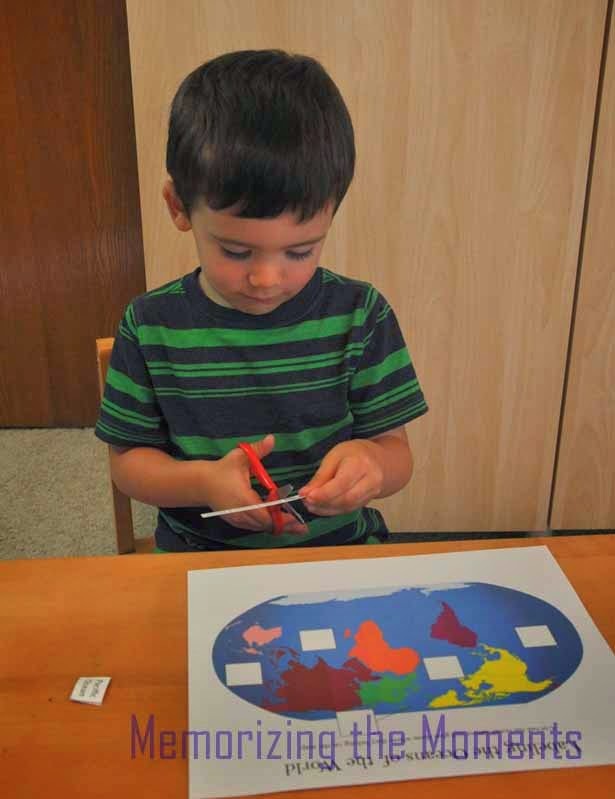 A couple weeks ago I was posted about our new Usborne Affiliation, and I am so excited to finally post the review (UPDATE, the Usborne Affiliation is no longer active). As a disclaimer, I was given these products in exchange for my honest opinion about them. The opinions are definitely my own. I received 5 products above. I asked for things that were more interactive than normal books. 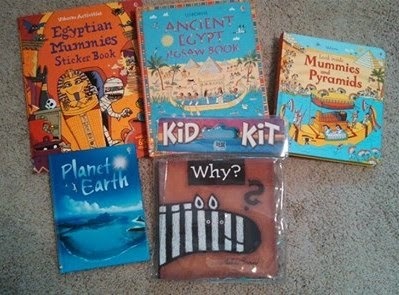 Also, Xander has been obsessed with mummies, so three of the books go with an Ancient Egypt theme. 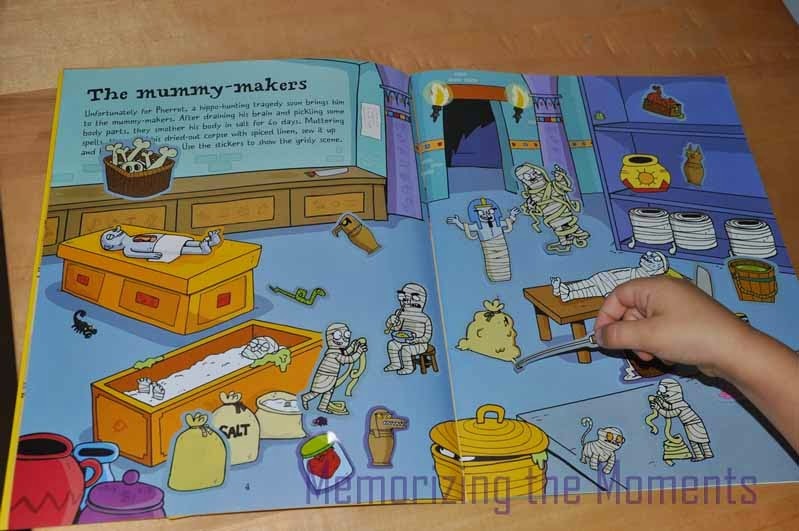 The first book we read was Look Inside Mummies and Pyramids, and I think it was definitely both Xander and my favorite. What struck me first is how thick and sturdy the book was. 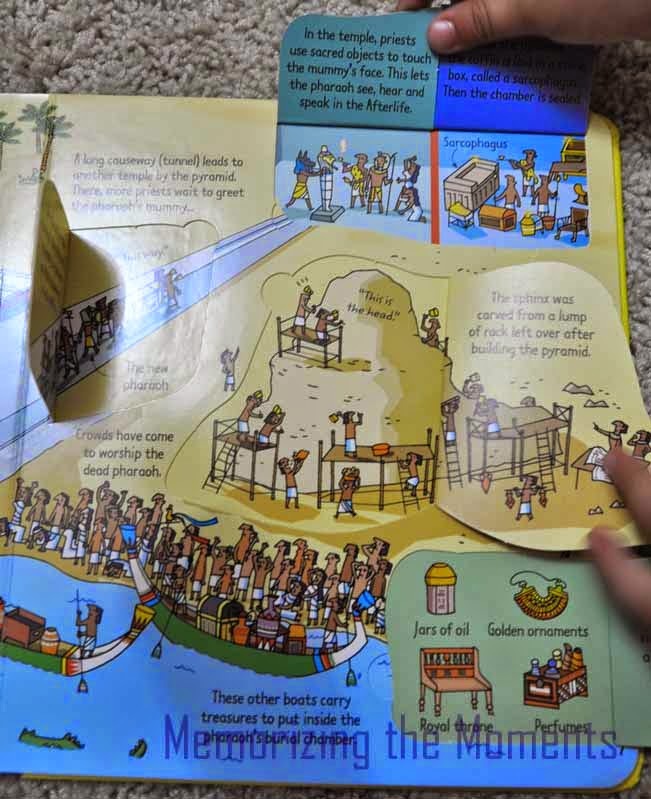 Lift-flap books always make me nervous, because I'm slightly OCD, and torn or bent pages REALLY bother me. 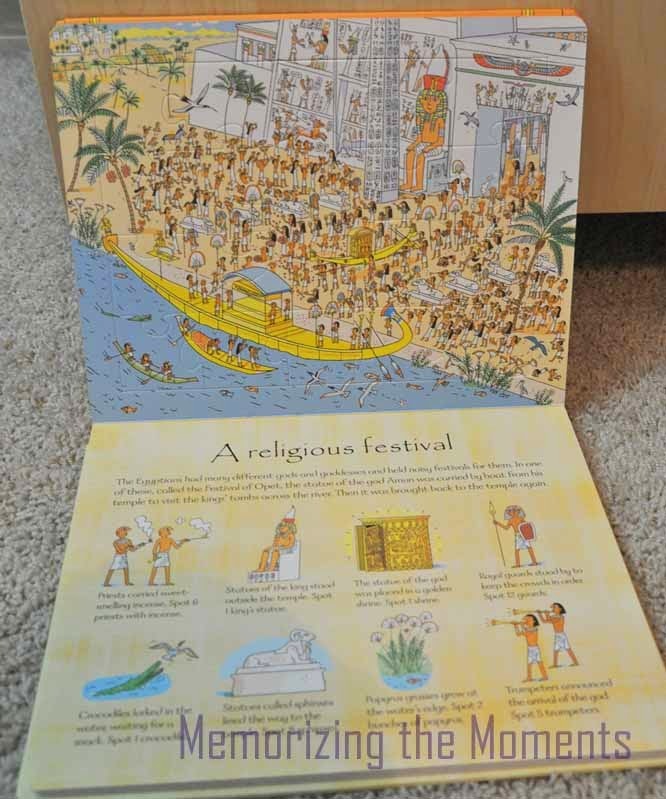 The pages were all impressively thick and the flaps seem like they will hold up to lots of use. 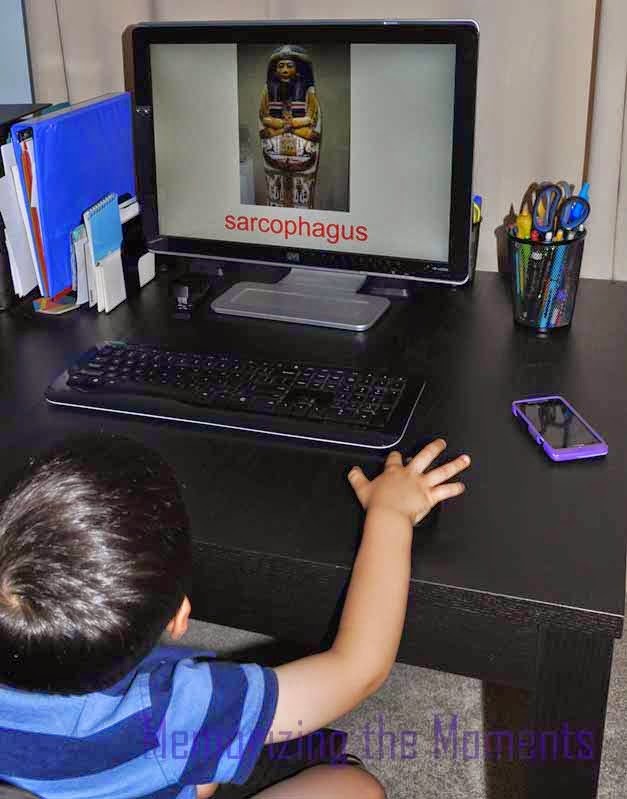 Xander really liked the adventure of finding what things on the page would lift up. I liked how when the flaps were down you saw the outside of whatever it was, but then when you lifted, it looked like you were seeing inside. 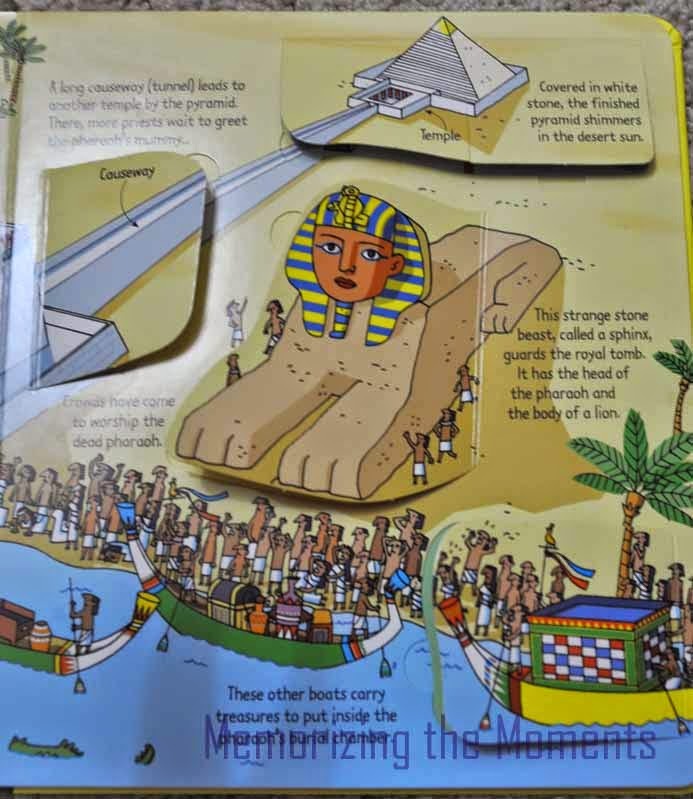 Some pages even have two layers of flaps to lift. Another thing that struck me was that this was a pretty lengthy, information heavy book, but Xander wanted to sit and read it cover to cover. 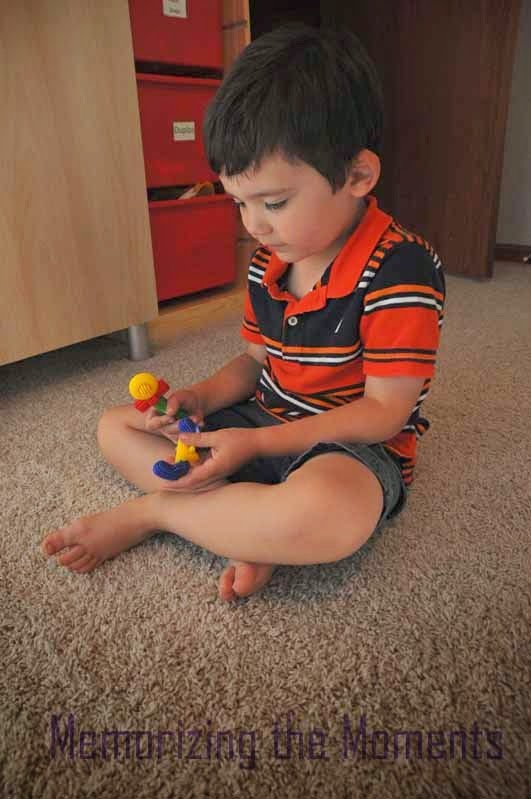 He has also frequently picked it up to read on his own. I would consider this book a win. 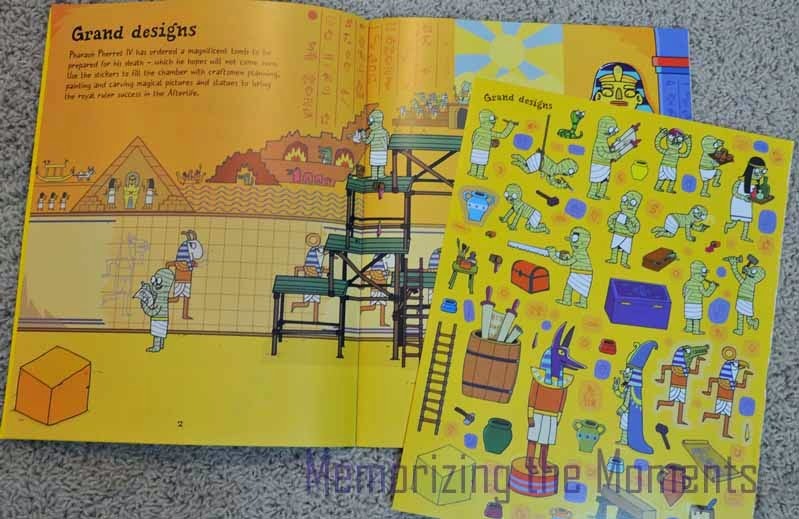 The second book we played with was the Egyptian Mummies Sticker Book. 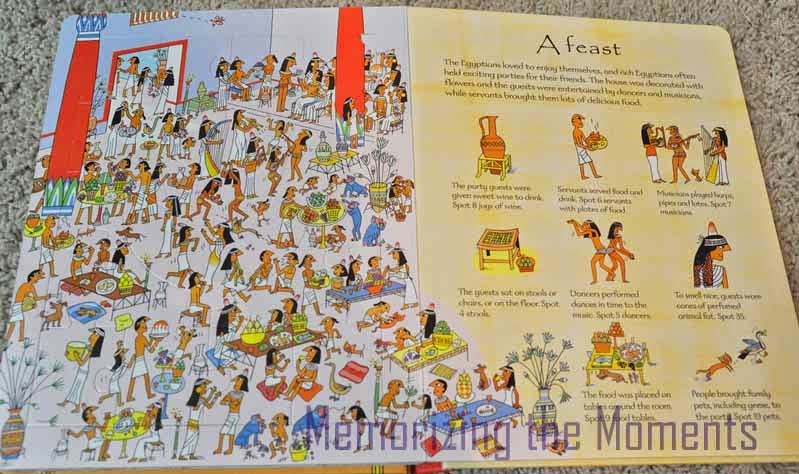 It has a page with a short bit on information and a scene. Then there is a whole page of pictures to go with each scene. 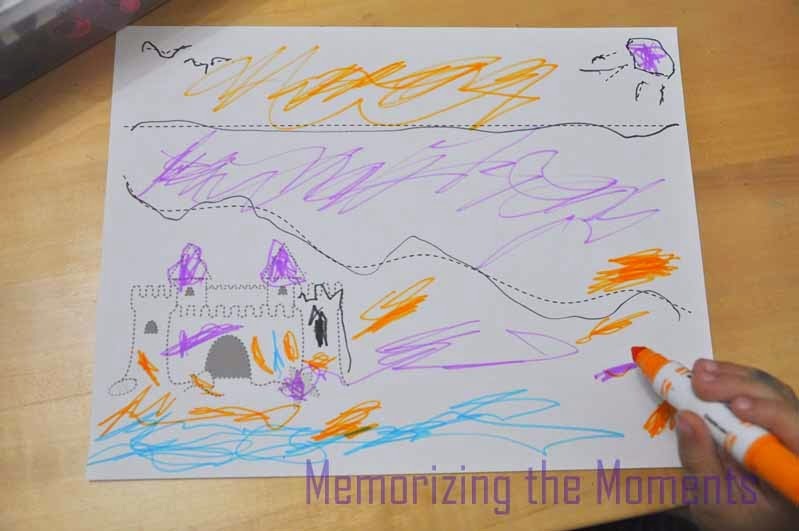 Some of the pictures have obvious intended places, but most of them just allow the kids to design the scenes. The pictures are more comical than factual, but I think that is okay. Also, it is not the most information heavy book in the world. However, my expectation of it was to be more of an activity for Xander. 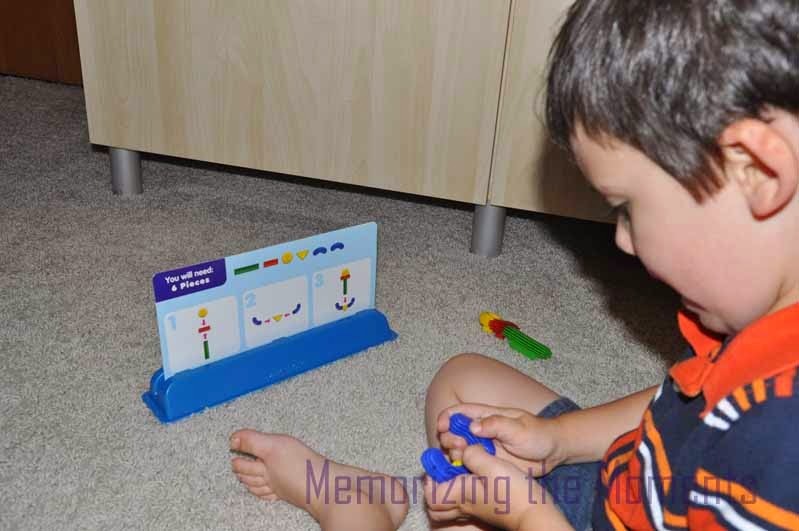 It turned out to be a great way for him to practice his fine motor skills. My biggest problem with it was that he wanted to do the whole book at once. I had to convince him to break it up. 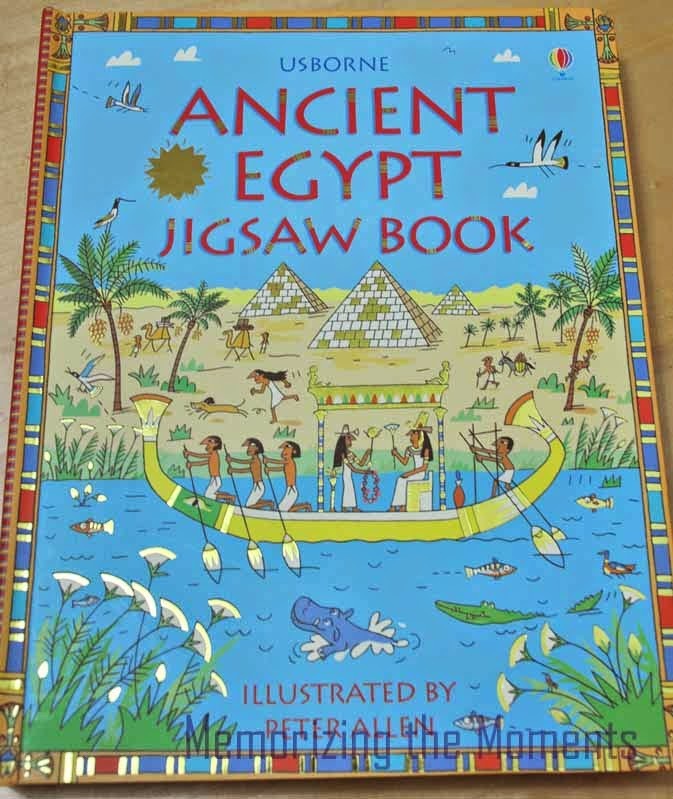 The third book we looked at was Ancient Egypt Jigsaw Book. 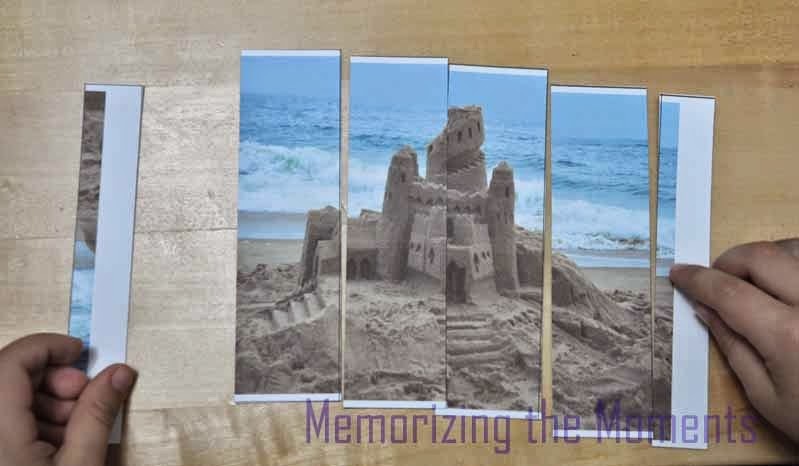 Every page has a puzzle, a short paragraph of information, and some items to search for in the picture/puzzle. 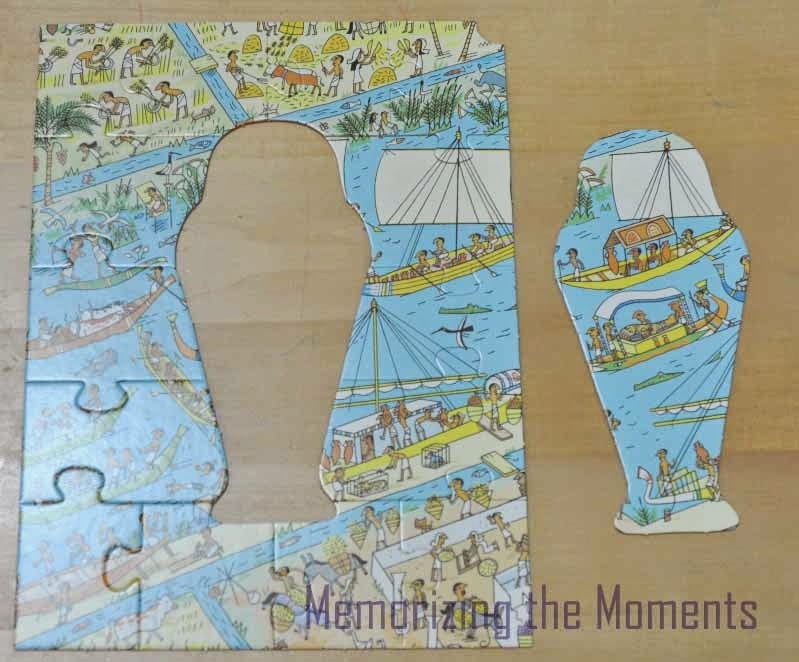 Xander and I have done the search and find part of the book, but he hasn't actually wanted to do any of the puzzles. 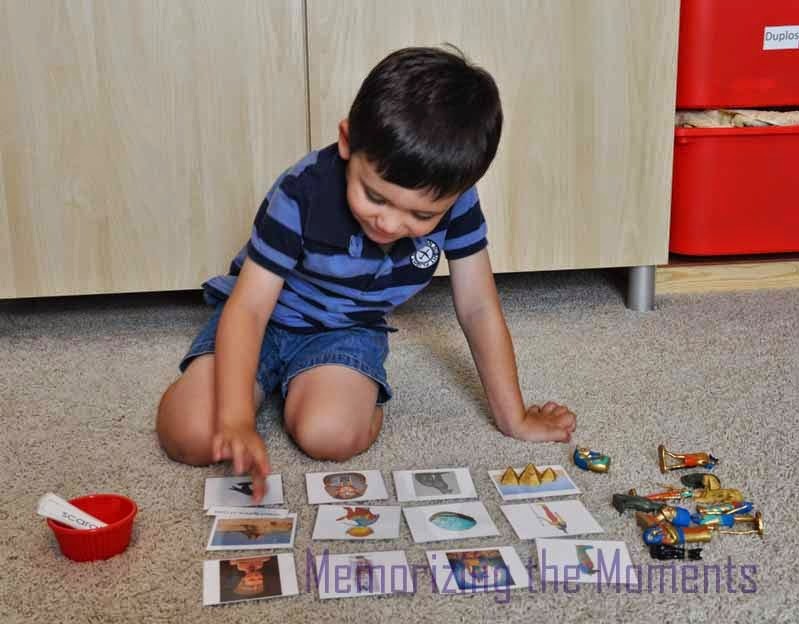 I think he's a little intimidated by them because there is so much going on in the pictures (and he's 3, even the simplest jigsaw puzzles are still a challenge for him). 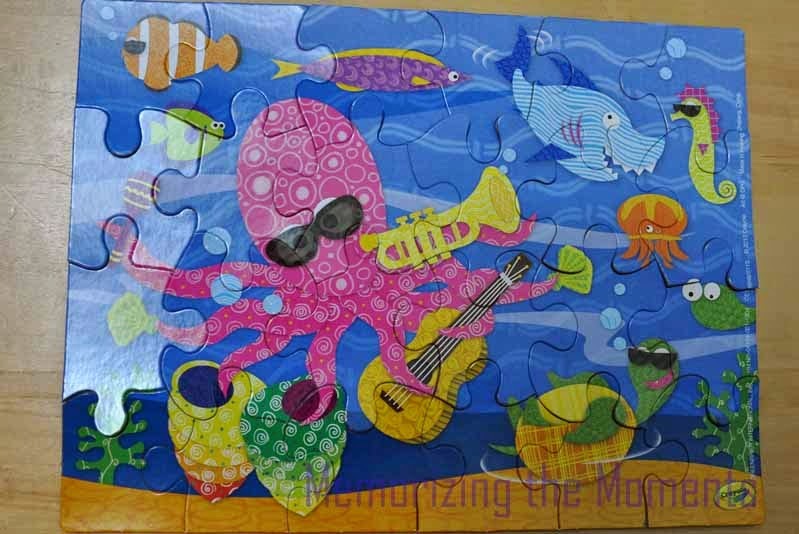 While I thought it was neat that every puzzle has an interesting shape in the middle (see pics below), I did not like that the puzzle pieces EXACTLY match the picture behind them. 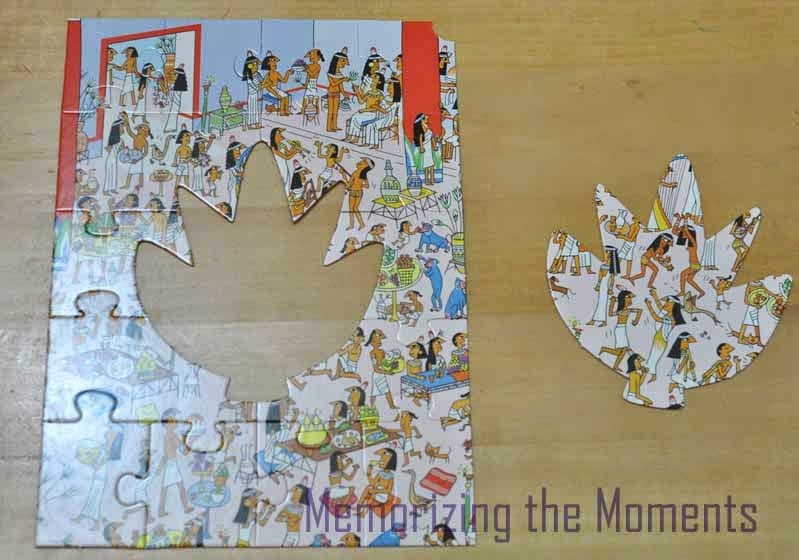 When you're assembling the puzzle in the book, it is hard to tell where you have already put pieces. It would have been nice if they had faded the background picture, or even made it black and white. 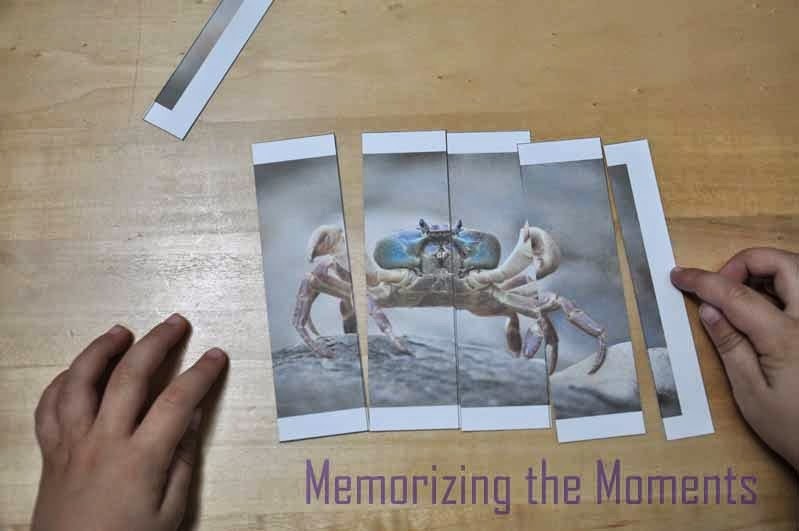 This book is also very sturdy and well made, although occasionally the puzzles fall out of their page onto the page next to them when you flip through. I also decided to try one of the Kid Kits, specifically the Whyld Animal Kid Kit. 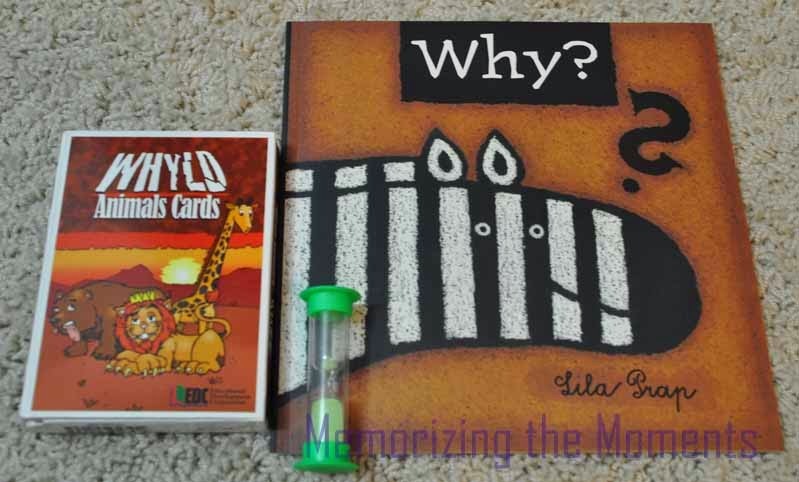 This kit came with a book and a card game and timer. 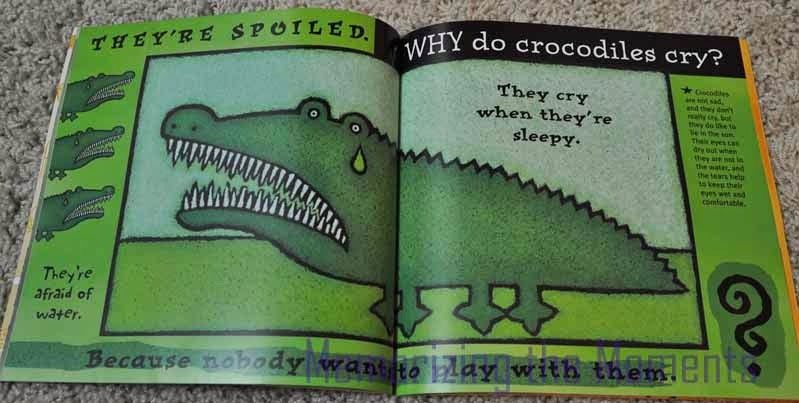 The book had a bunch of silly questions and answers about animals. Xander really reading it! He thought it was pretty funny. 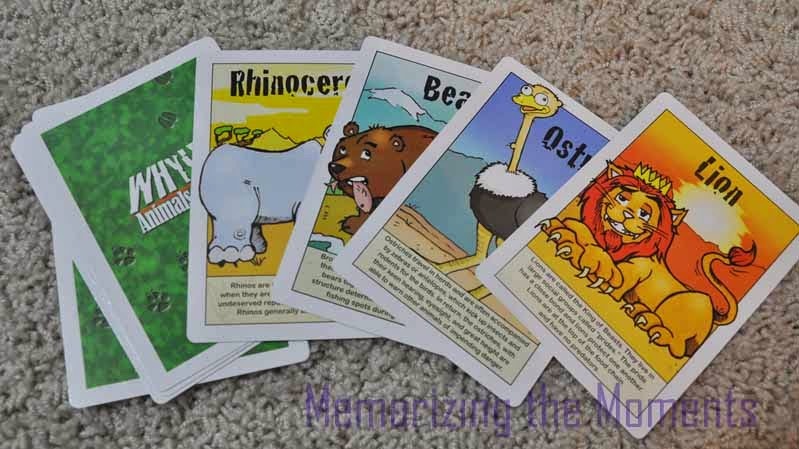 The card game has two colors of cards with pictures of animals on them. You draw one from each set, one for the front of a silly "Whyld animal" and one for the back. 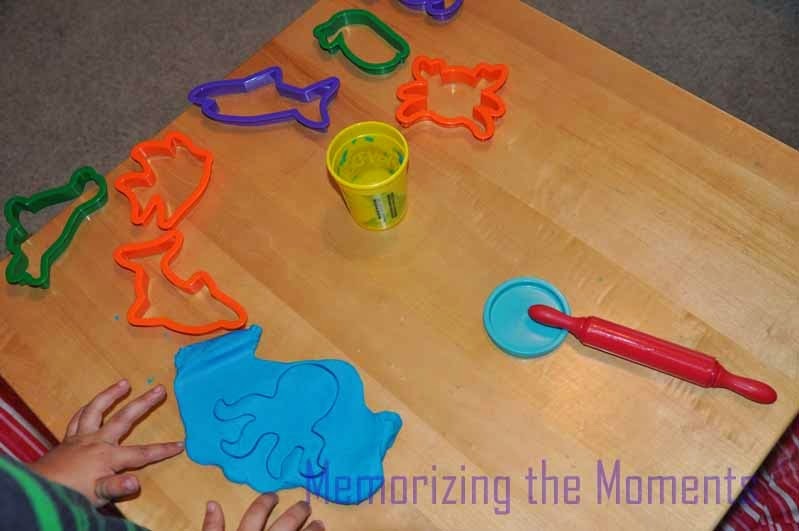 Then you have to draw or act out that animal to get the other players to guess what you had. While I think it was a cute idea, it wasn't the best game for us. Xander is an only child, so we played with Grandma and Grandpa. Since Xander didn't really "get" the game yet, it was mostly us adults playing. I sent the game to daycare to see if the kids have more fun with it there. 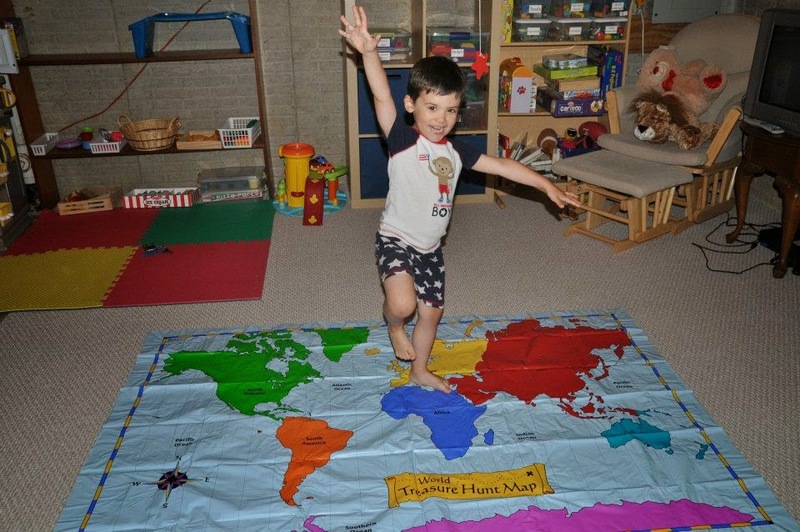 Hopefully, it is something we can use more when he's older and has friends over. 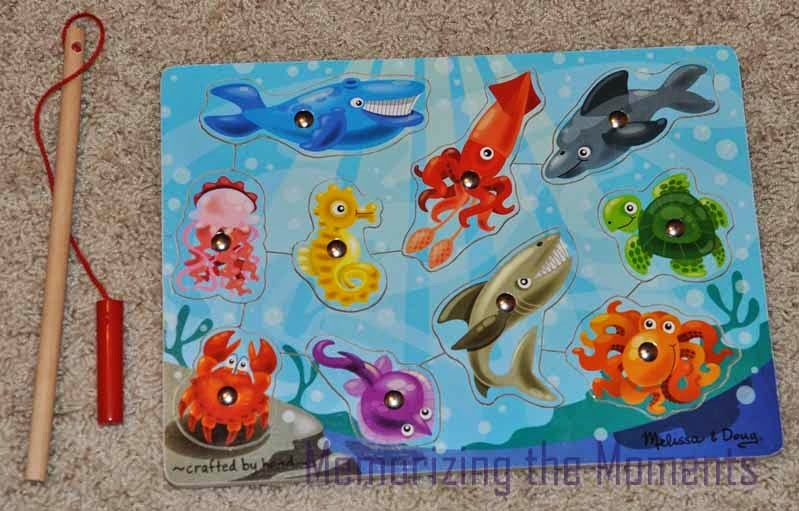 Until then, I think Xander will enjoy looking through the cards because they have animal facts on them. 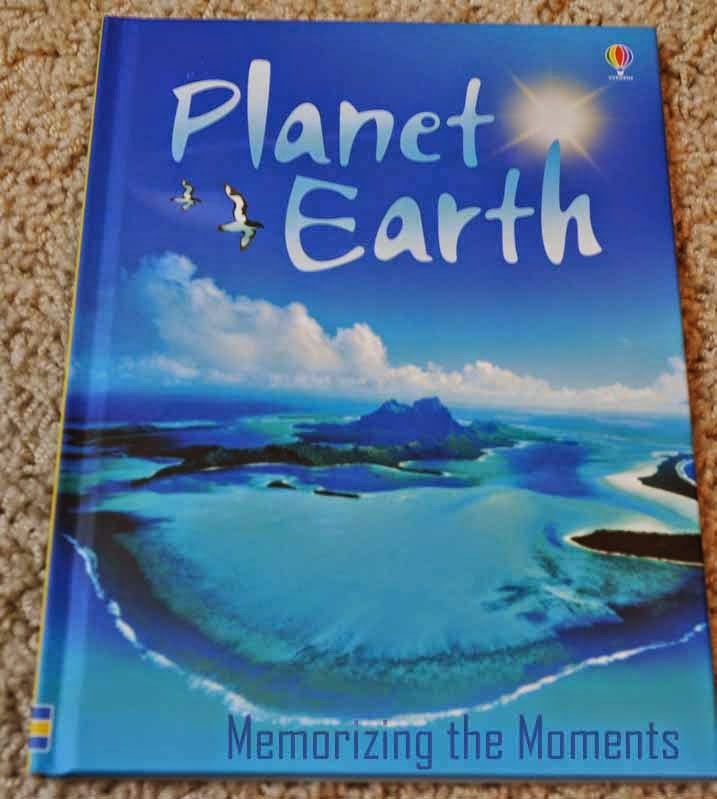 The last book we received was Planet Earth. While we haven't read it together yet, I have flipped through it myself. It has some very pretty illustrations. I was also impressed by the number of concepts it covers. 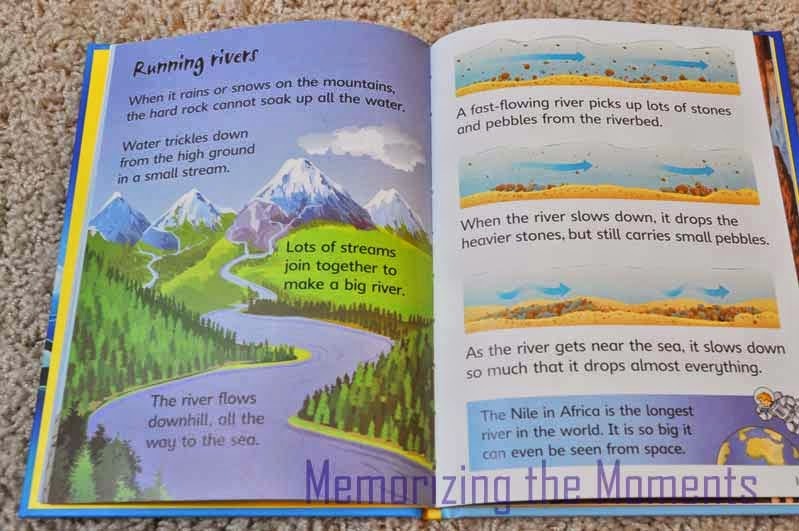 I'm currently teaching high school earth science, and I think it covers even more concepts than we do in the semester (although not nearly as in depth... it's a kids book). 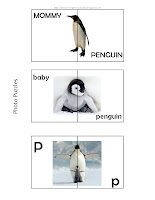 I also really liked the balance of pictures and diagrams to explain concepts. I look forward to reading this book with Xander and see us coming back to it repeatedly over the years. 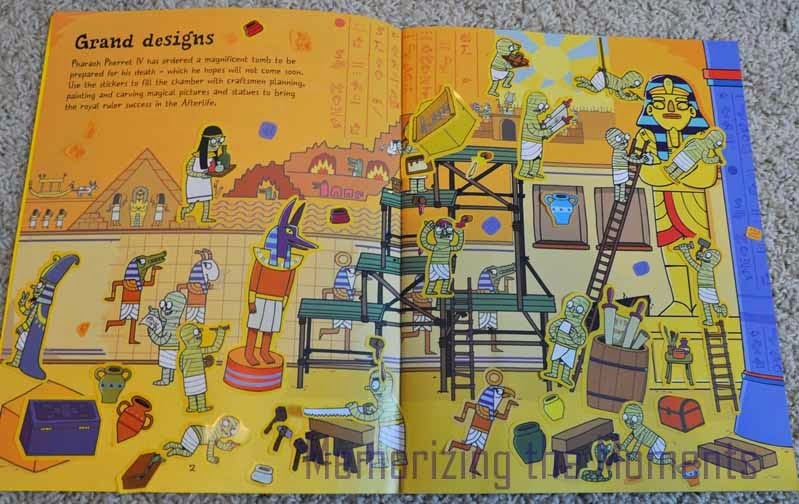 I've been working on an Ancient Egypt theme lately. 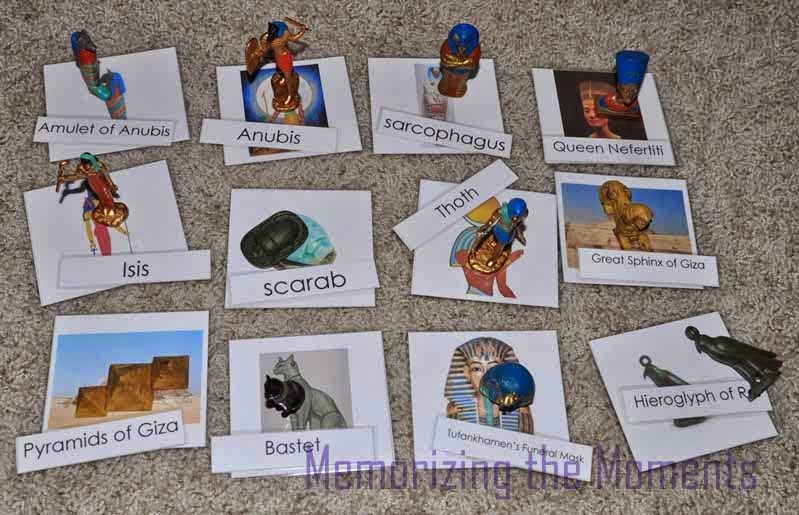 To go with it I picked up the Ancient Egypt Toob and made some accompanying 3 part cards. 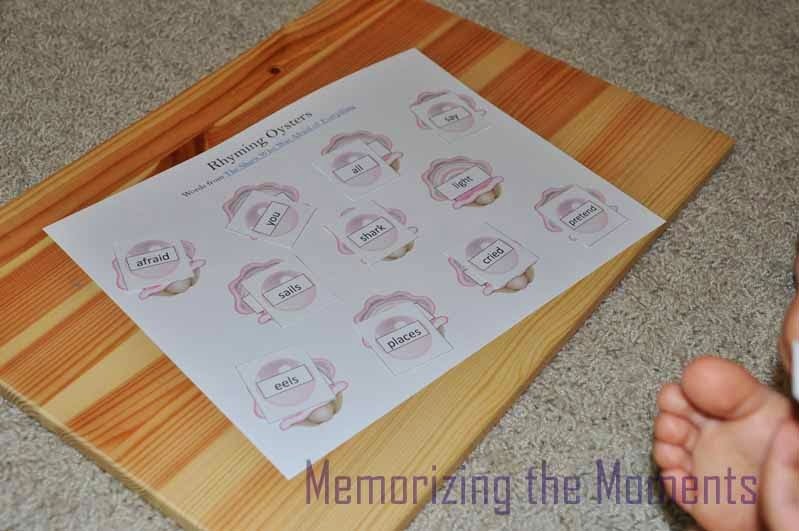 I also made a Little Reader lesson for those of you who use that program. 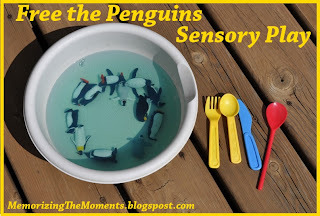 You can download the Little Reader Lesson here. 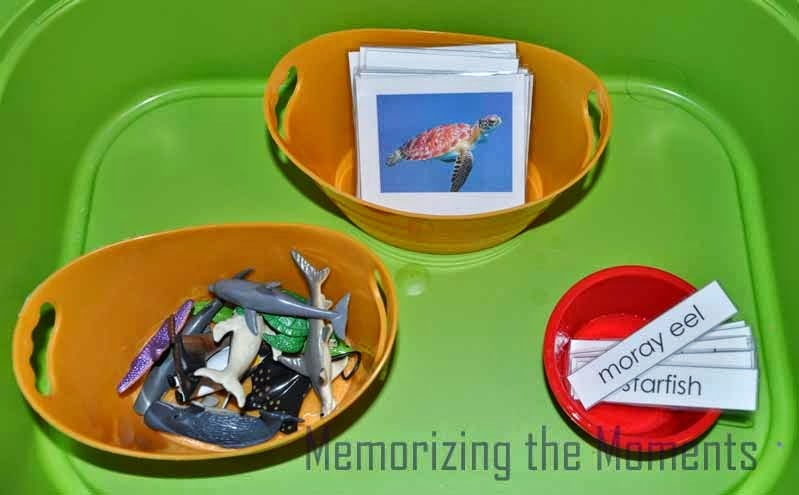 I always introduce a new set of cards on Little Reader (I explain how we set up Little Reader here). After viewing the lesson a few times, he usually does a great job matching up the cards! Now that we've finished our first theme, I realized it would be easier for my readers to have a all of our ocean related materials in one location. 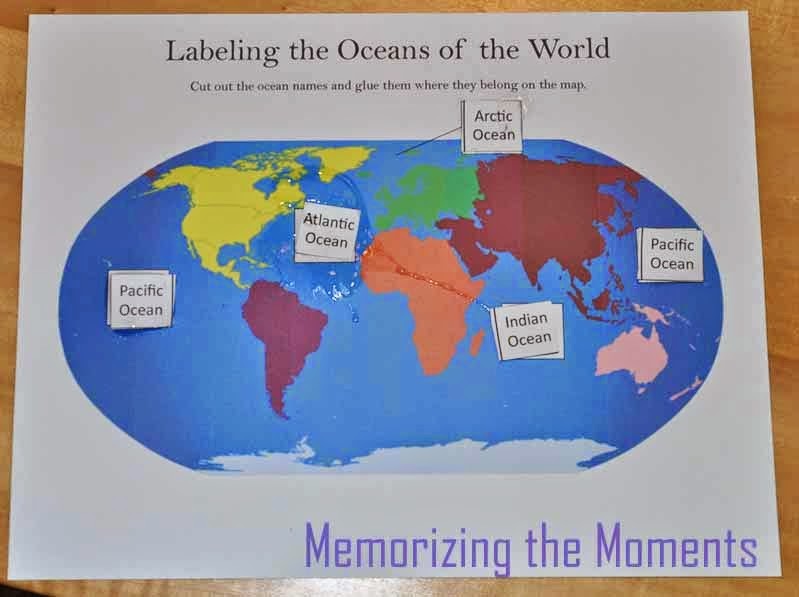 Here are links to all of the printables and blog posts related to oceans! 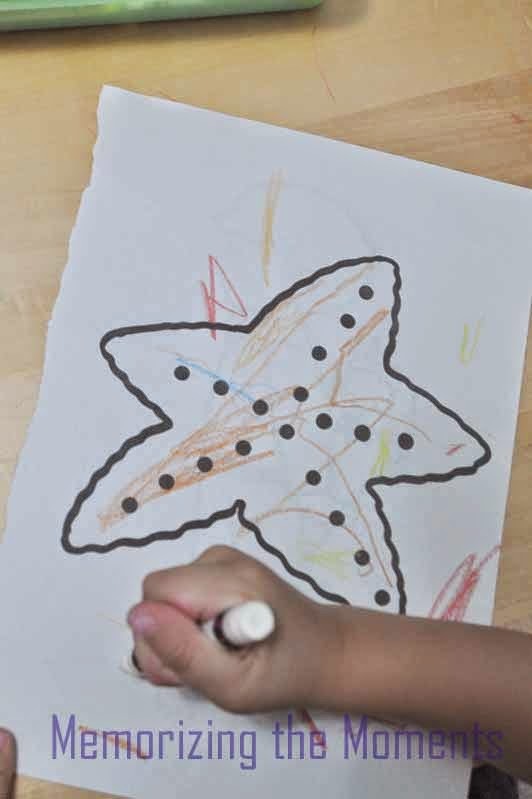 We have graduated from letters of the week to preschool themes! 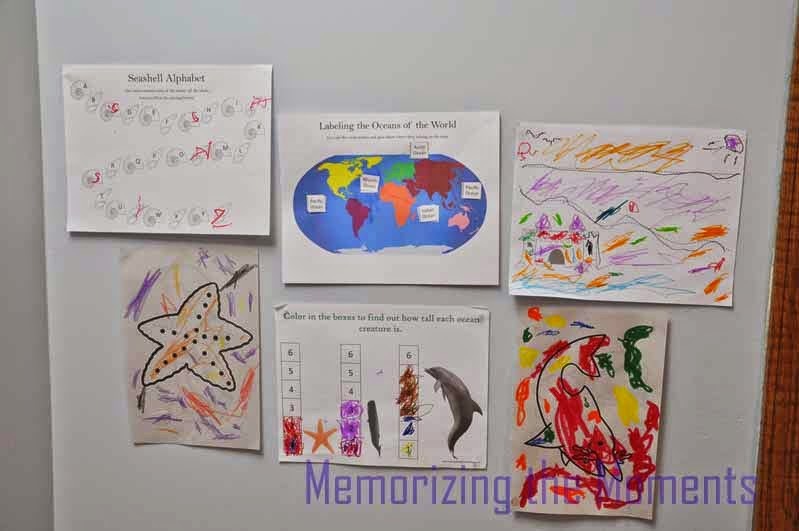 (Check out these posts for our learning goals and how our school work will be organized. 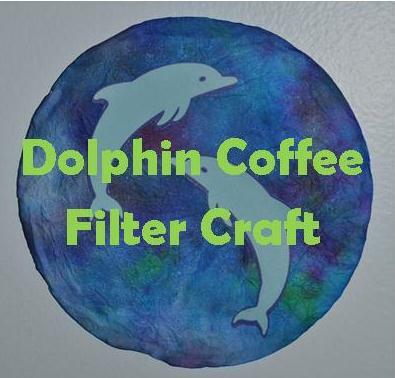 I'm hoping to make our themes fun and hands on). Our first theme was oceans, and I would consider it a successful first theme! I tried to break them down into categories for you, but some of them fall under more than one. 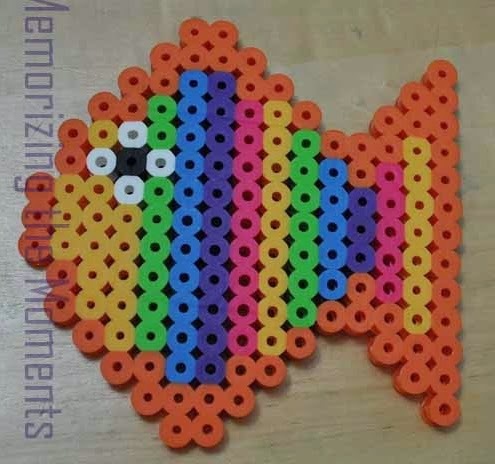 We got some biggie beads and the fish template (from Michaels with a coupon). I was a little worried that it would be too challenging and tedious for him, but he surprised me! I showed him how to do one row at a time (the left most column, since he's right handed and he knocked the over less that way) and I got out the appropriate beads. Then he put them all on. It took two sessions but he was incredibly proud of himself when he finished! The kid sure does love his Slick Stix. 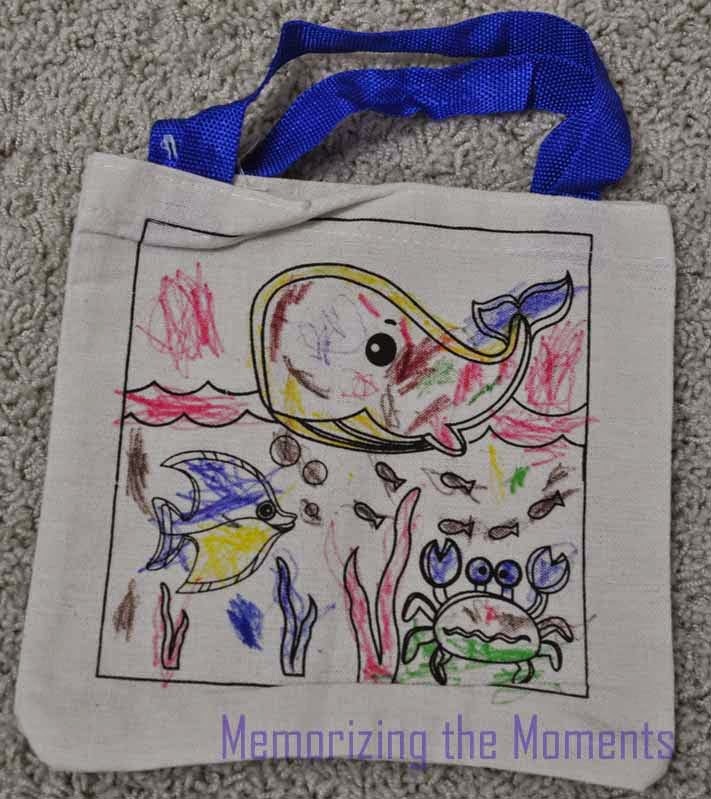 He made this little ocean tote bag at daycare. He also brought home this adorable little "aquarium" made with paper plates, cereal, and tissue paper. 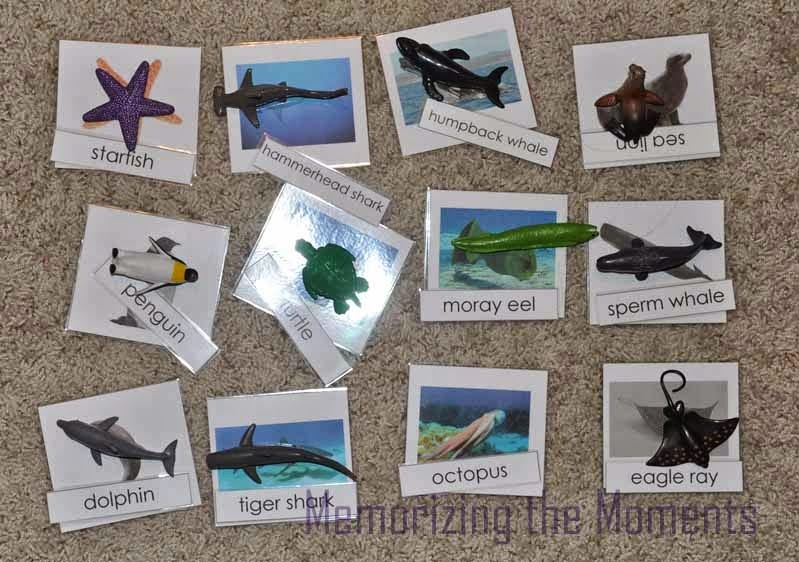 We read The Shark Who Was Afraid of Everything and then we did the rhyming oysters activity from my oceans and beaches printable pack. 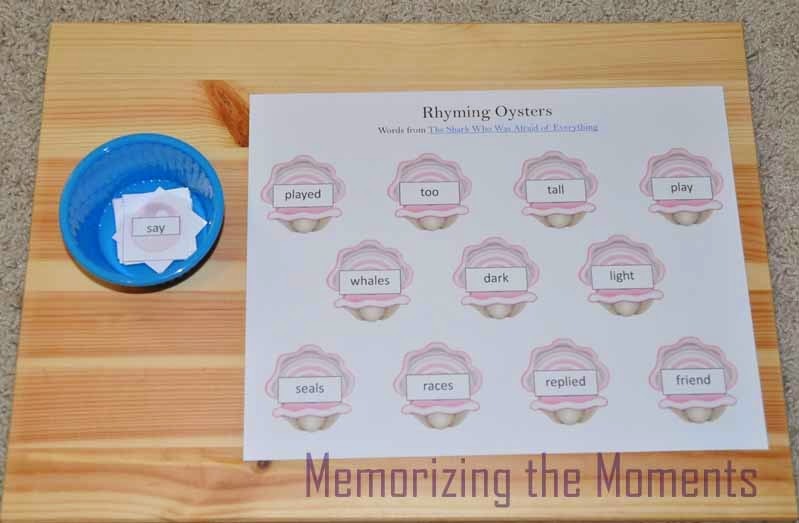 The words for the pearls and oysters all came from the book (although you could still do the activity without reading the book). 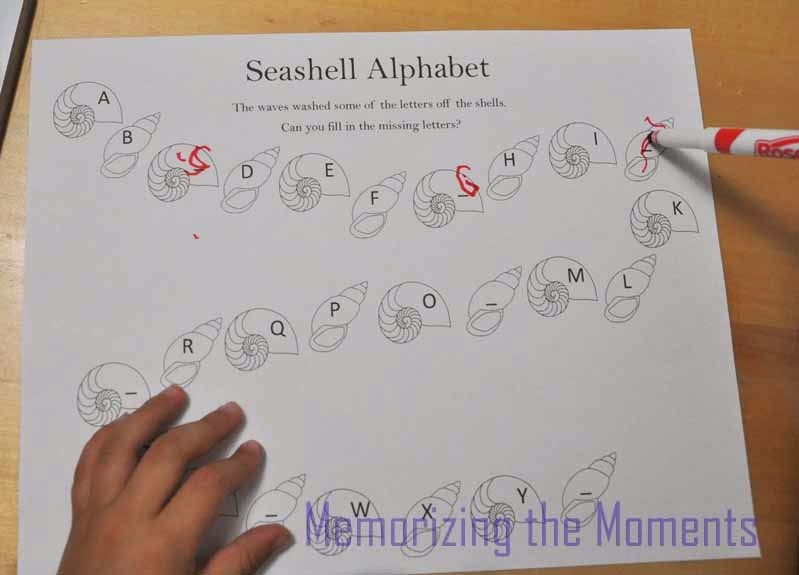 Working on a seashell worksheet. This was tough for him since he had to make his own letters. He enjoyed it, though. 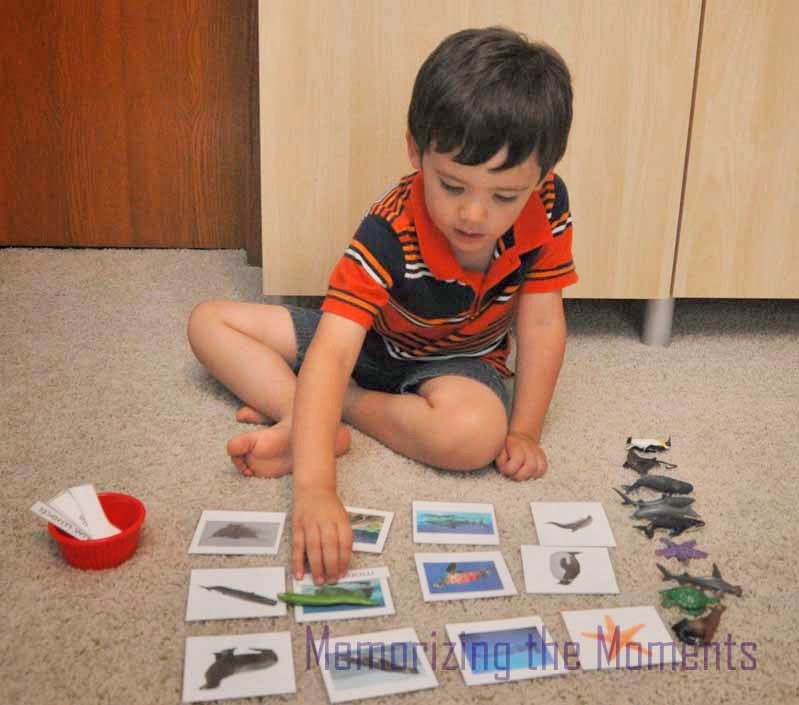 Xander had fun matching up the names, pictures, and animals from the Oceans Toob. You can print the cards free here. 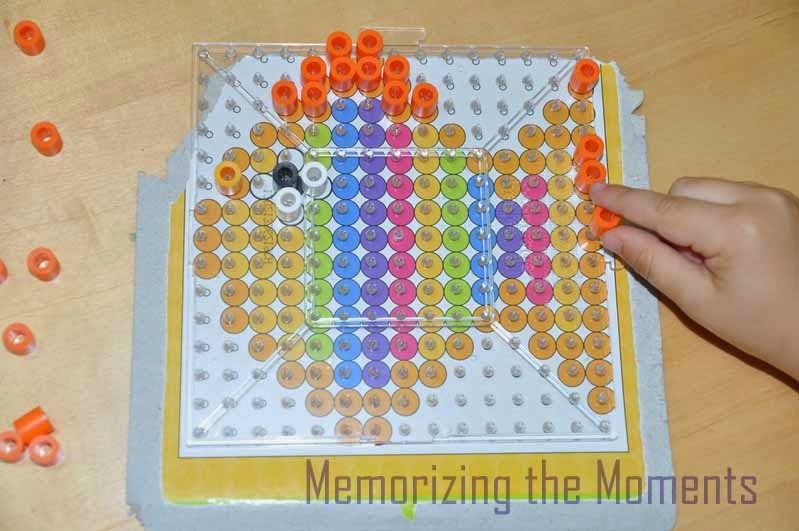 Still doing All About Spelling (see our post on how we adapted it here). We're back to using the letter tiles instead of the 3D letters we had been using. As always, the biggest part of our literacy development is simply reading a lot of books! 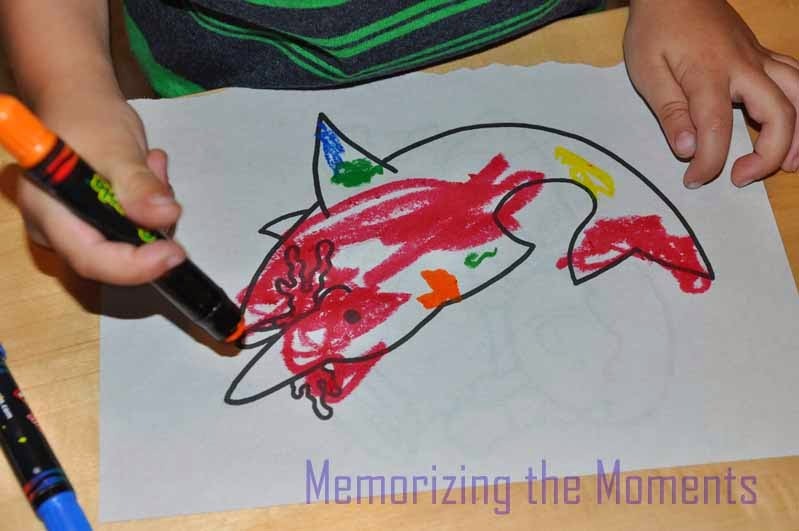 We read about dolphins, sharks, whales, walruses, etc. We have way too many ocean related books to list them all, so I'll just include some of our favorites. 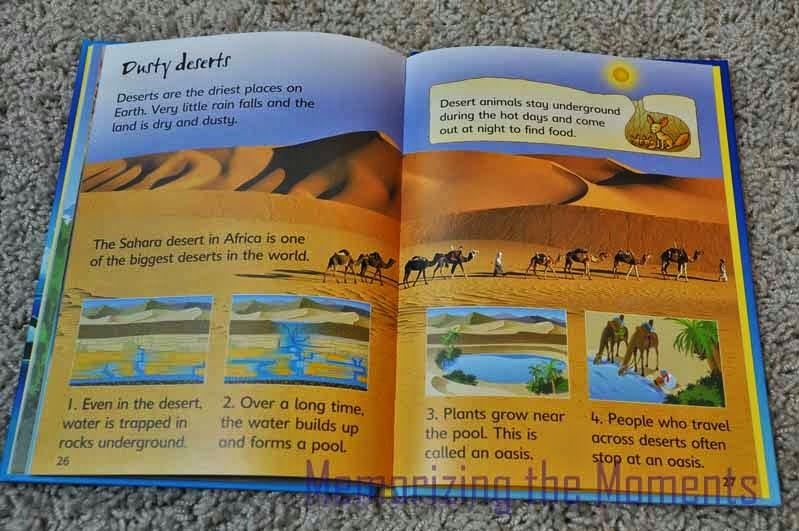 Xander particularly likes the National Geographic Kids books because they have silly jokes in them. 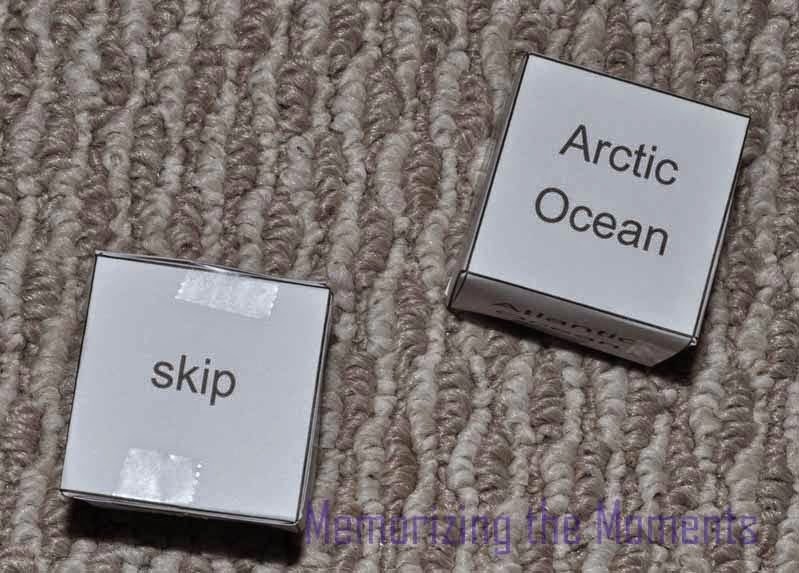 I made these dice to play a geography game (in the printable pack). One has the oceans on it and the other has actions. 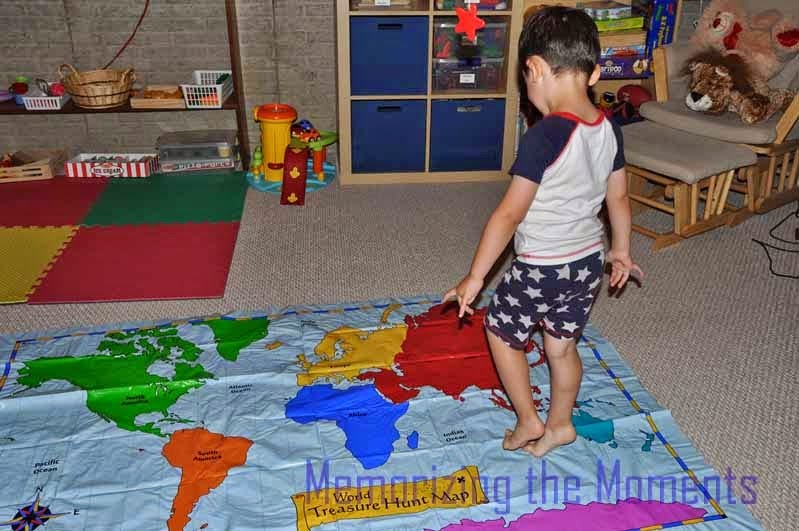 He would roll the dice and then do the action to get to the correct play on his big map (from the World Treasure Hunt Game). Here he is tip-toeing to the Indian Ocean. 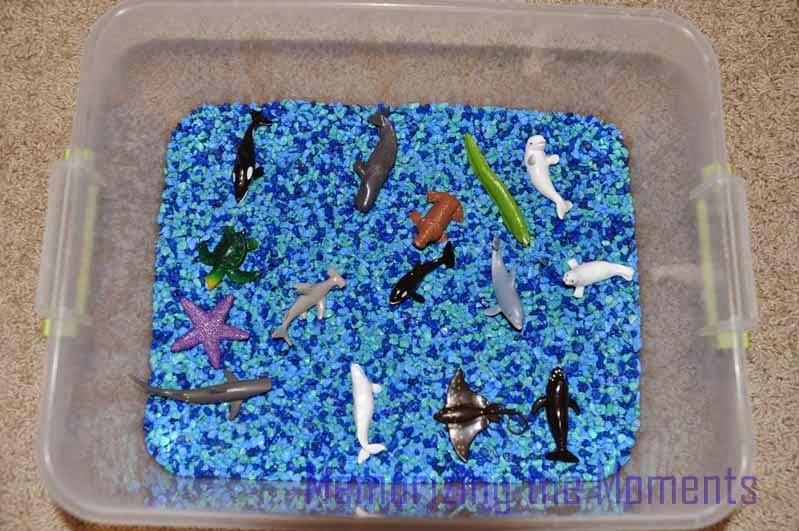 Ocean sensory bin made out of Toob Animals and aquarium rocks. 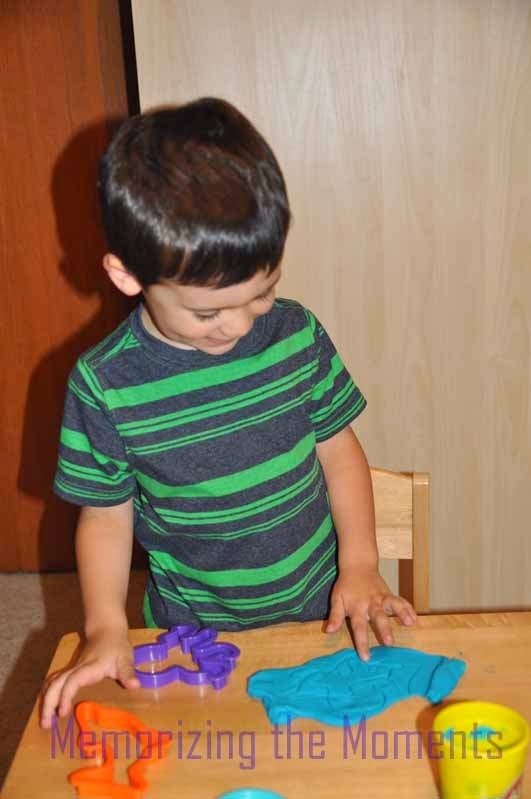 Play dough with ocean animal cookie cutters. Following Directions Building Set. There's an anchor and a boat. We didn't really do a lot of math this time around (even though we're supposed to be working on Right Start Math). 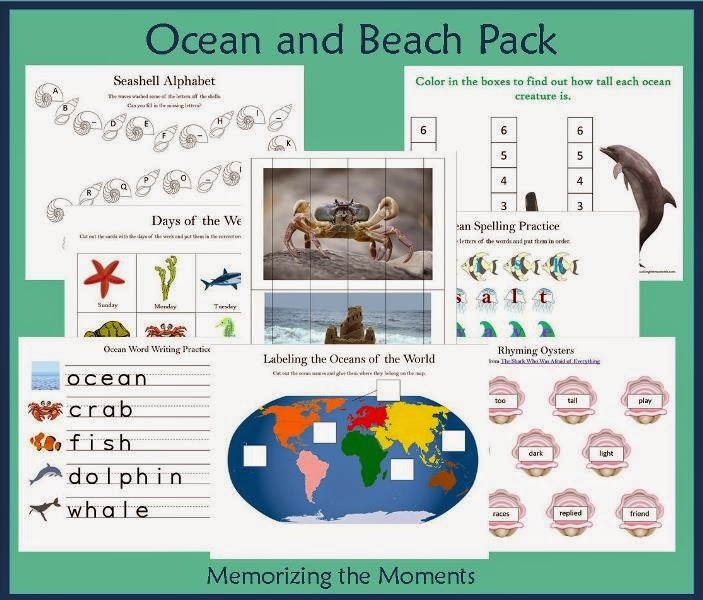 The Oceans and Beaches Printable Pack has a measuring page and these days of the week cards. 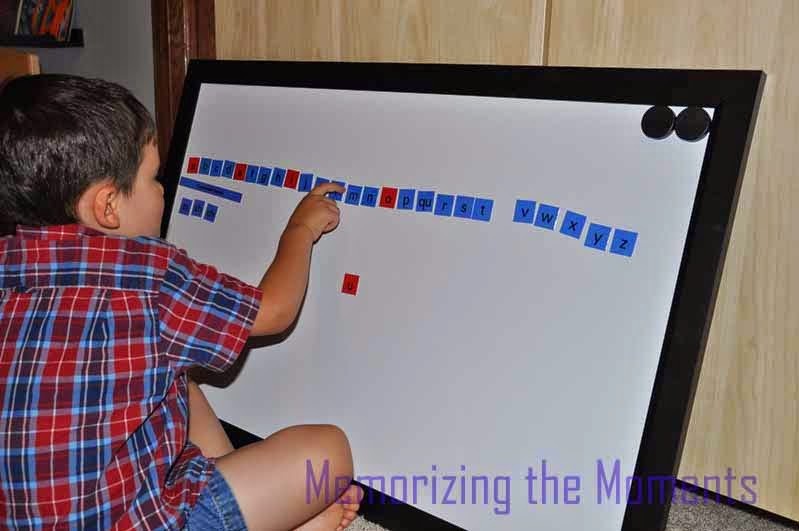 Xander did both the worksheet and sorted the days into the correct order. 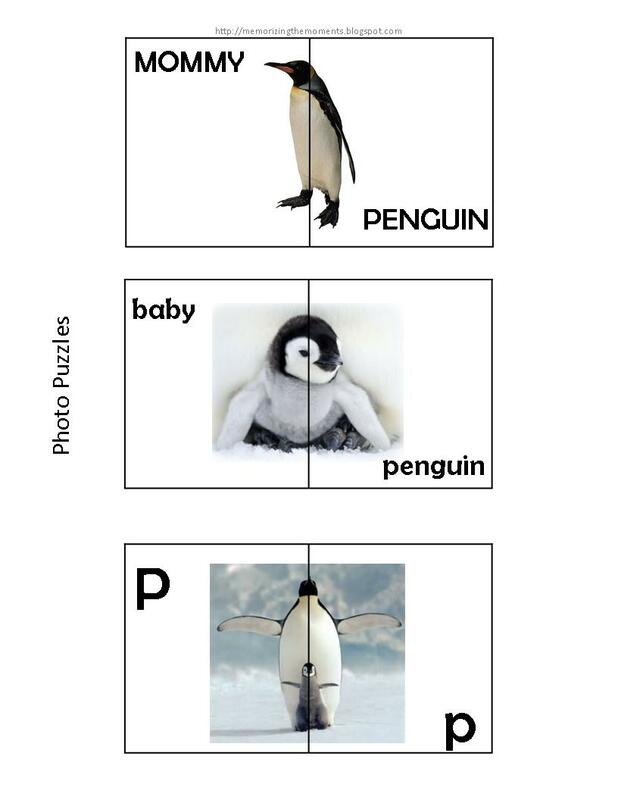 Although we've made it through all the letters for our Alphabet in Simple Science, I decided that I will still add letters now and then. 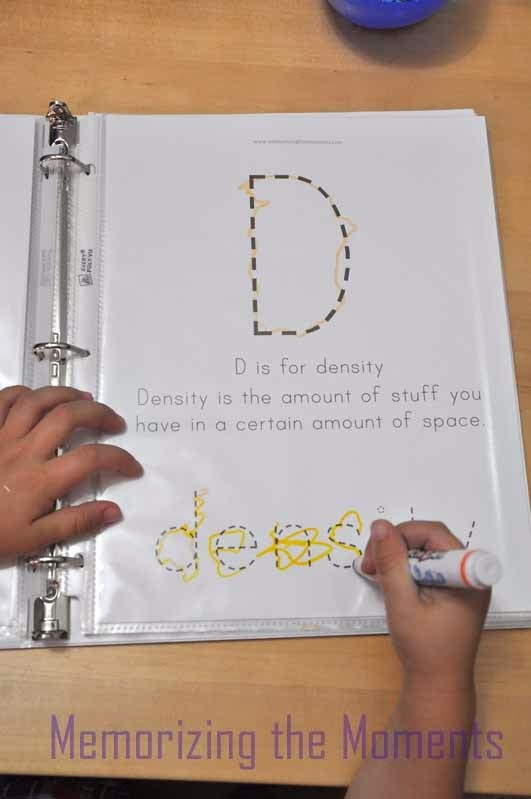 This week we did D for Density. 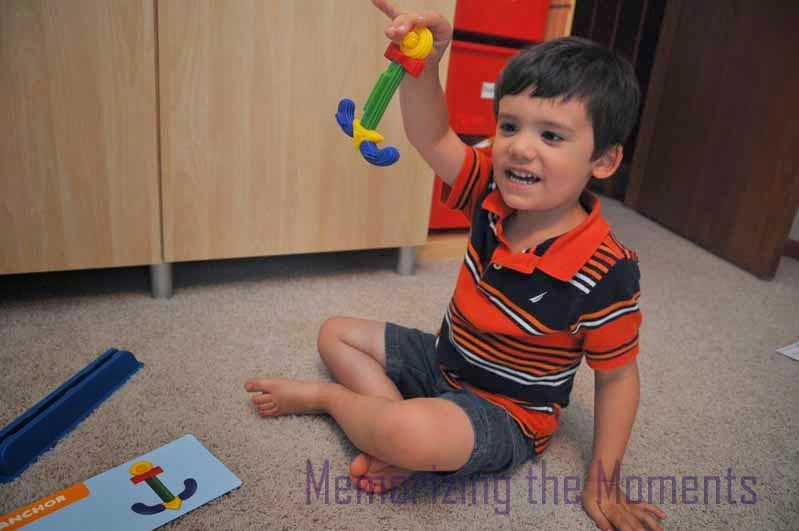 We watched some Magic School Bus and did some experiments. Check back for the full Density post!